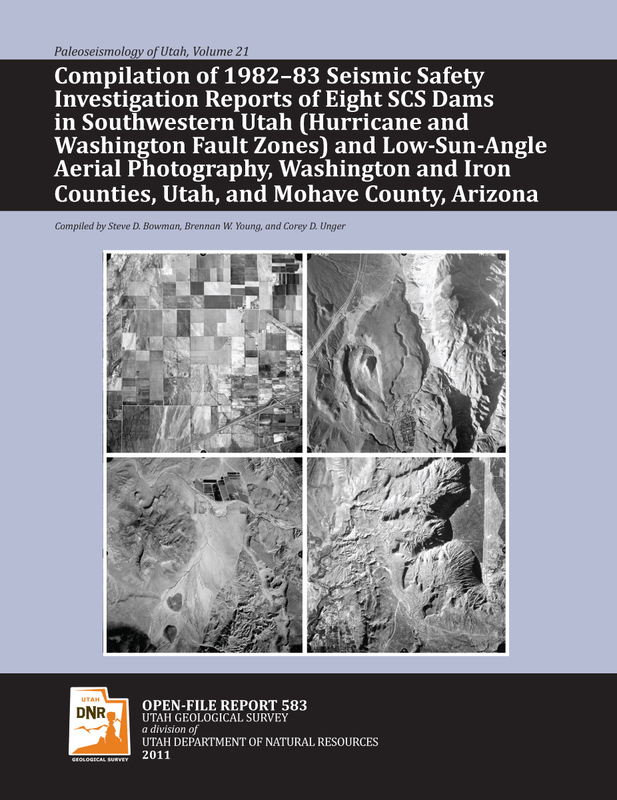 Compilation of 1982–83 Seismic Safety Investigation Reports of Eight SCS Dams in Southwestern Utah (Hurricane and Washington Fault Zones) and Low-Sun-Angle Aerial Photography, Washington and Iron Counties, Utah, and Mohave County, Arizona: Open-File Report 583. Each aerial photography compilation includes digitally scanned aerial photography frames in TIFF format, explanatory text, Google Earth index with reduced resolution thumbnail images of the frames, an ESRI Shapefile for use with GIS software, and one or more frame center point index sheets in Adobe PDF format. Scanned, original project indexes are included, if available. Due to the large file sizes of scanned aerial photography frames, these files are available on DVD from the Natural Resources Map & Bookstore and may be available in the UGS Aerial Imagery Collection. Bowman, S.D., and Beisner, K., 2008, Historical Aerial Photography; 1938 Salt Lake Aqueduct Project; Salt Lake, Utah, and Wasatch Counties, Utah: Utah Geological Survey Open-File Report 537, 2 p., 1 plate, DVD. Bowman, S.D., Beisner, K., and Unger, C., 2009, Historical Aerial Photography, 1937 Farm Service Agency AAJ/AAK Project, Davis, Weber, and Box Elder Counties, Utah: Utah Geological Survey Open-File Report 540, 2 p., 1 plate, DVD. Bowman, S.D., Young, B.W., and Unger, C.D., 2011, Compilation of 1982-83 seismic safety investigation reports of eight SCS dams in southwestern Utah (Hurricane and Washington fault zones) and low-sun-angle aerial photography, Washington and Iron Counties, Utah, and Mohave County, Arizona: Utah Geological Survey Open-File Report 583, 4 p., 2 plates, six DVD set.